Source: Data in Brief - 17:1158-1162. | April 1st, 2018 | By Dobaradaran S, Khorsandd M, Hayatid A, Moradzadehe R, Pouryousefie M, Ahmadie M.
In this article, we measured the levels of fluoride in groundwater. 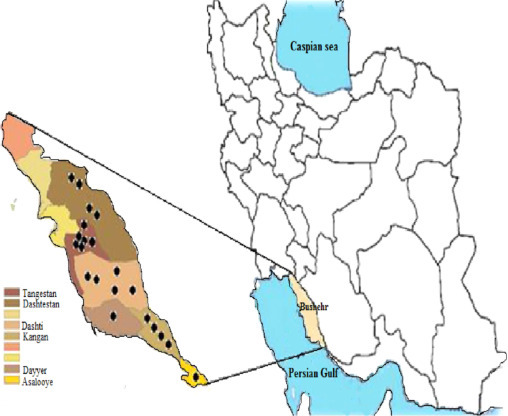 The samples were taken from groundwater in Bushehr’s province, Iran. After the collection of samples, the concentration levels of fluoride were determined by the standard SPADNS method using spectrometer. The mean concentration levels of fluoride in water of all stations were higher than the WHO drinking water guideline. Microsoft Office Excel 2016 was used for calculation of mean values. The mean concentration level of fluoride instatement were in the range of 1.52 to 3.64 mgl-1. The maximum and minimum daily intake of fluoride based on 2 l daily water on consumption reached 3.04 and 7.88 mg day-1 respectively. The data presented here showed the Removal of high concentration of fluoride (F) from drinking water is necessary in this region and measures should be taken to supply water after removal of fluoride for the betterment of the livelihood in the area. Data shown here may serve as benchmarks for other groups working or studying in the field of pollution control, aquatic ecosystem. In the data, as shown in Table 1, the mean±SD concentration levels of fluoride in groundwater samples in all station samples were 2.08 ± 0.7 mgl-1. The lowest and highest F concentration levels were 1.52 mgl-1 and 3.94 mgl-1 in samples S19 (Kangan) and S4 (Tange eram) respectively. As shown in Table 2, the concentration levels of fluoride in water of all stations were higher than the WHO and USA, UK, Canada drinking water guidelines for fluoride. As seen Table 1, it shows that the mean value daily intakes of fluoride based on 2 l daily drinking water consumption reach 0.36 mg day-1with a range of 0–0.96 mg day-1. Table 1. Concentrations of fluoride (mgl-1) in groundwater samples of measured stations (maximum values are expressed as bold italics; minimum values as bold underlined). *Based on 2 l daily drinking water consumption and concentration levels of fluoride in drinking waters. Table 2. Different drinking water quality guidelines for fluoride. Nine town in Bushehr province, Iran were selected as sampling points including Anarestan, Bushkan, Tange eram, Khormouj, Dayyer, Shonbe, Kaki, Kalame and Kangan (Fig. 1). Fig. 1. Locations of groundwater sample stations. Water samples were collected by using 200?mL polyethylene bottles that were washed three times with deionized water; prior to collecting each sample, and then bottles were labeled with the sample number and location for identification. All samples were stored in a dark place at room temperature until analysis. After that, for the fluoride analyses, the SPADNS colorimetric method was used with a spectrometer , , , , , , , , . Daily fluoride intakes were calculated based on 2 l daily drinking water consumption and concentration levels of fluoride in waters. Microsoft Office Excel 2016 was used for calculation of mean values. The authors are grateful to the Urban Water and Wastewater Company Bushehr (Grant no. 1053) for financial support. The funder had no role in study design, data collection and analysis, or preparation of the manuscript. W.H. Organaization, Fluorides and oral health: report of a WHO Expert Committee on Oral Health Status and Fluoride Use [meeting held in Geneva from 22 to 28 November 1993], 1994. S. Dobaradaran, A.H. Mahvi, S. DehdashtiFluoride content of bottled drinking water available in Iran.